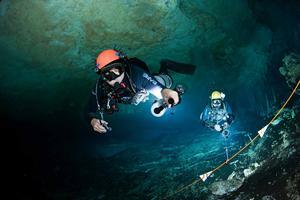 The Bahamas Underground is the Bahamas only technical and cave diving oriented training and adventure facility. 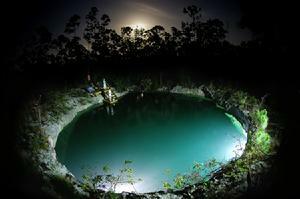 Located in Marsh Harbor, Abaco, Bahamas, the Bahamas Underground provides TRAINING and GUIDED DIVING SERVICES to some of the best blue holes and underwater caves in the Bahamas. 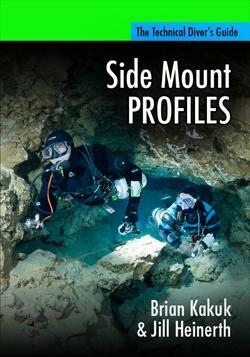 The Bahamas Underground is operated by Brian Kakuk. With more than 15 years of cave EXPLORATION experience in the Bahamas, Brian can provide training in all levels of cave and technical diving as well as provide guiding services for small groups of cave divers (3 divers). The warm and highly decorated blue holes and underwater caves of Abaco offers exciting experiences for all training levels, from cavern tours, to deep mixed gas cave penetrations. 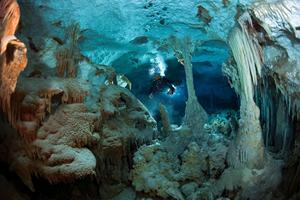 THE MOST DIVERSE UNDERWATER CAVES IN THE WORLD! 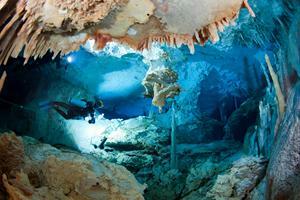 If there is any one thing that separates the caves in the Bahamas from anywhere else on earth, it is their diversity. The ocean caves here are literally filled with marine life such as sponges, lobsters, crabs and shrimp. 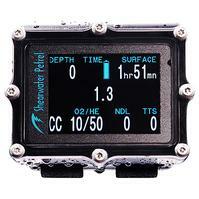 The entrances of many ocean blue holes can only be described as over stocked aquariums! Inland caves vary from deep fracture caves and sinkholes, to shallower incredibly decorated passages filled with water as clear as air. So whether you are into depth, distance, beauty or the most diverse ecosystems found in any undewater caves in the world , you can be sure that you will find it here in the Bahamas. "Frozen Rain" soda straw stalactites in Ralph's Cave. Photo by Brian Kakuk - Click on image to view video. Bahamas Underground can make it happen! Kayak cave diving � enables access to some of the more shallow, out of the way marine caves located in the extensive tidal creeks of the island. Boat cave diving � many of our amazing marine caves are accessible by boat. Inland, �bush diving� � our vans are set up for safe, efficient cave diving on any part of the island. 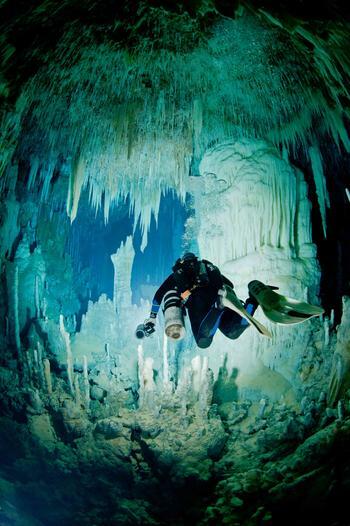 If cave diving in the Bahamas interests you, then the Bahamas Underground can make it happen!